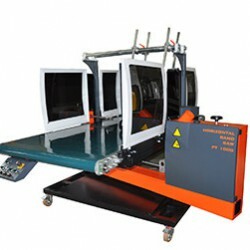 Horizontal band saw is used to cut edges of thermoformed products. Fixing of moldings is carried out by the use of rollers which press edges of formed parts to transport belt for regular cutting of material. You can adjust the speed of transport belt and rotation of the saw blade. Specially mounted band saw allows stepless adjustment of cutting height of a workpiece by use of a gearmotor and an inverter. Cutting speed can be adjusted according the shape of the molding and its level of hardness. Stiffness of construction and its mobility ensure very accurate cutting, even in the case of using high and wide moldings.